AP Civil Assistant Surgeon Recruitment is purely contract basis only. The contract period will be one year. Minimum qualification for these posts is MBBS. The eligible candidates are suggested to send their application on or before 25-10-2018. 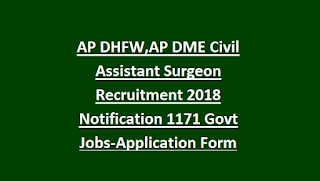 There are total 1171 job vacancies are available for AP Civil Assistant Surgeon. 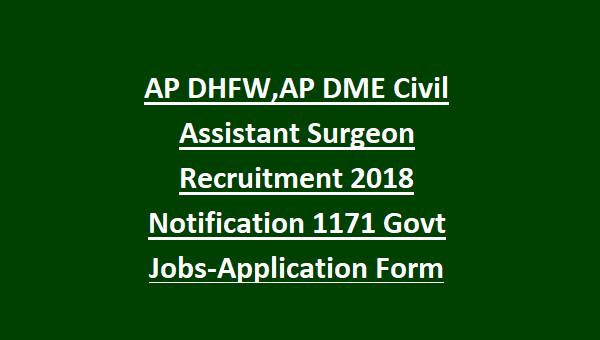 Click here to see the official notification of AP Civil Assistant Surgeon Recruitment-2018..
As on 01-07-2018 the candidate's age limit should be in between 18-42 years. 10 years of relaxation is given to the candidates of PH candidates. The candidates must have qualified MBBS Degree and should have registered with AP Medical Council though they have registered with MCI. The selection will be based on the competitive process. Depends upon the applications there is a chances of conducting written test. Otherwise a personal interview will be conducted and based on merit in academic records and experience final list will be selected. The candidate has to send the filled application in the envelope of size 12×26 cm with Postal stamp Rs. 35/- in an envelope should be super scribed with ” Contract Basis Recruitment -2018 – Application for the post of CAS” to the O/o the Dist. Medical & Health Officer, Guntur on or before 25-10-2018 by 05:00 p.m. And send attested copies of Marks Memo of SSC or equivalent certificate, MBBS Marks memos of all years and Provisional Certificates, Internship Certificate and Permanent Registration of APMC, caste certificate, study certificate from Class–IV to X where the candidate studied and PH certificate if applicable. The Director of Public Health & Family Welfare, Himagna Towers, 3rd Floor, Saipuram Colony, One Centre, Gollapudi, Vijayawada. Andhra Pradesh, PIN: 521 225. Please share this Andhra Pradesh Health and Family Welfare Department Civil Assistant Surgeon Recruitment 2018 to your beloved friends through social networking site. If this information is helpful to you please share or like our page.